Army Flag Display Cases For Your Family And Friends. Army Flag Display Cases from Flags Connections are made with pride, and if you are looking for Army Flag cases that are made in the USA, you have come to the right place. Choose from a huge selection of Army Medal Frames, Army Flag Holders, Army Flag and Medal Display Cases and much more. 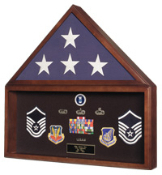 If you want to buy a gift to show a friend or family member how proud you are of their service, invest in Army Veteran Flag Cases, or Army Veteran Medal Frames. 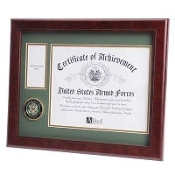 Buy Army Photo and Award Medal Frame Shadow Boxes so that you can display a folded flag, an army photo and of course, any other display items like war medals and public service certificates. The Army Photo and Award Medal Frame Shadow Boxes are perfect as a keepsake and are so well made that you can pass them down from generation to generation. 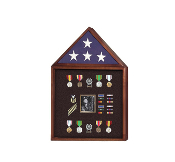 If you are tired of keeping your war hero’s medals in a shoebox in the closet, order the Army Deluxe Awards Case Medal Frame. Of course, this wonderful display case is available for all five branches of the military including the Army, Navy, Air Force, Army, and Coast Guard. 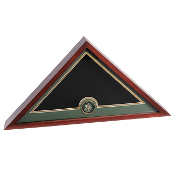 The Army Deluxe Awards Case Medal Frame is made from the highest quality wood available. Each bevel cut frame stores a photo and a beautiful die-cast gold plated medallion designating which branch of the Armed Forces your friend or family member served in. Show off your family members Purple Heart in Army Medal Frames. The outer dimensions of the Deluxe Army Awards Case Medal Frame are 16” wide x 20” high. You can hang four award medallion necklaces that will keep them looking just like they did when they were awarded. The case medal frames are double matted against a wooden frame bevel cut that is colored with a rich and solid mahogany. The solid oak or walnut Awards Case Medal Frame also has a glass front and a laminate back panel that comes with a hanger. 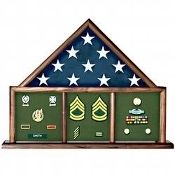 Show off your loved ones achievements with Army Award Display Cases. Display prized photos, medals and much more. 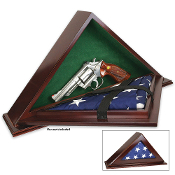 Keep his or her most treasured possessions in Army Flag Display Cases, or Army Flag Holders. Army Award Display Cases are more affordable than you think and look great on the wall, mantle, or shelf. 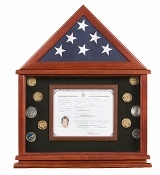 The Flag and Medal Display Case is crafted out of Oak or cherry, and is the best way to display all of your friend or family members memorabilia, certificates, and of course the flag. Proudly made in the U.S.A., the Army Flag Display Case holds a 3’x5’ folded flag, which you can purchase separately, certificates and medals. 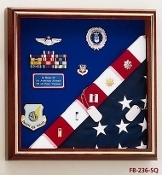 You can purchase a larger Flag and Medal Display Case to fit a larger 5’x9.5’ burial flag. 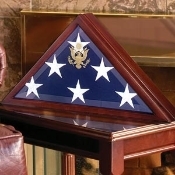 If you want to show your friends and family members how much you care, Flags Connections is the only place you need to shop for Army Flag And Metal Display Cases, Army Retirement Gifts, Army Veteran Medal Frames, and of course, Army Veteran Gifts. With holidays just around the corner, the question is what makes the perfect gift for your loved one in the U.S. Army - whether they are in basic training, serving overseas, stationed far away, or proudly retired from a long and storied career in the U.S. Army? Get them a gift that's Army strong! Know a former serviceman or woman whose proudly deserved medals and honors are now collecting dust in an attic? This we'll defend with an Army Flag and Certificate Display Case – an army shadow box perfect for displaying American flags, stripes, insignia, medals and other memorabilia, in a luxurious photo frame and shadow box that makes a perfect addition to any home or office. The army shadow box photo and award frame gift set is available in either a solid oak display case or walnut flag display case. 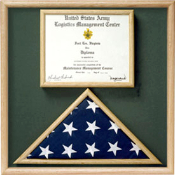 These elegant Army Flag and Certificate Display Cases are designed to hold a folded flag, framed documents and other memorabilia all in one convenient place with a low gloss frame. 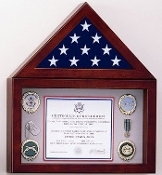 We offer our army photo and award medal frame shadow boxes to suit most needs for displaying your loved one's folded flag, army photo and other important display items, such as U.S. military award frames, war medals, public service awards and items for a family keepsake. Three of the five available display case styles are available in two sizes: one for a 3 x 5 flag and one for a 5 x 9.5 flag. All of our army shadow box cases are lined with our basic army green background fabric, and come with complete care and basic hardware installation instructions. Honor the living veterans as well as the fallen with one of our army shadow boxes that come complete with flag holder and certificate frame. With our line of army photo frames, take care that their military photos and honors stay safe and intact with memories for generations to come. 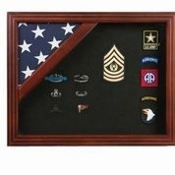 These solid oak and walnut Army Flag and Certificate Display Case Shadow Boxes come lined with the authentic cloth used for army service uniforms, not imitation fabrics, so you may rest assured that the fabric lining your case will be perfect for you or your loved one. Even the wooden frames are all authentic, built with American craftsmanship. We do not stain our wood. What you see is what you get, in rich red oak or walnut, finished with a clear coat of polish to enhance the beautiful grain and preserve the wood's natural colors. For those of you who want to display more than just one flag, this wonderful Army Flag and Certificate Display Case makes a boastful and patriotic addition to any corner in your home or office as a keepsake. 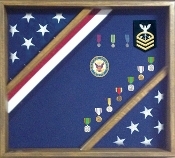 The combinations of flag shadow box, army photo frame and army award frame are virtually endless. With our excellent customer service, let us help you create the perfect gift for the beloved army service man or woman in your life with an army shadow box from Flag Connections!